MILWAUKEE, WI--(Marketwired - Oct 12, 2015) - A new season brings new safety precautions to consider as daylight quickly turns to dusk and temperatures begin to drop. With school routines and activity schedules in full swing, Master Lock is reminding families to fall back into safety without falling victim to vulnerabilities with helpful advice and reliable products. "As families settle into the new school year, we want to remind them of security precautions to help ensure they have a safe season," said Rebecca Smith, vice president, marketing for Master Lock. "Although schedules are busy, it's important for families to remember to keep safety and security a priority and to address safety topics." Don't let security fall by the wayside. Master Lock wants families to stay one step ahead with these tips to help keep loved ones safe and secure this season. 1. Secure the backyard: Swing sets, pets and pools are among the fun, recreational items found in many backyards. Keep these valuables secure with the Master Lock Magnum M175XDLF Padlock. 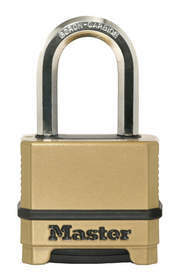 From storing pool toys or patio furniture to helping ensure pets remain in the yard, the Master Lock Magnum M175XDLF Padlock's Tough-Cut™ shackle is 50 percent tougher than hardened steel, making it ideal for protecting the most valuable items in sheds and storage lockers, or on fences and gates. 2. Lock up with lights on: Approximately 33 percent of break-ins occur through the front door, making it important to secure your home entirely to help avoid possible burglaries. To help protect against intruders, use a Master Lock 265DCCSEN Door Security Bar to resist forced entry through front, patio or sliding glass doors. For added precaution, make sure your outside lights are functioning properly and maintain a well-lit property to deter possible intrusions. 3. Gun safety: If a household possesses firearms, it is of the utmost importance that they are always secured, especially when children are present. Use maximum security measures by locking-up firearms and storing them in a safe that is located out of children's reach. Designed with a dual lever locking mechanism, the Master Lock 107DSPT Gun Lock can only be opened and closed when the key is inserted and turned for added security measures. The Sentry Safe Quick Access Pistol Safe provides ready access to your firearm when needed in an emergency, while its pry resistant solid steel construction helps prevent unauthorized access. Remember to always remove ammunition before storage, and keep ammunition in a locked location separate from firearms. 4. Protect digital data: Personal and sensitive information such as legal documents, social security cards and bank account passwords should always remain in a secure location away from prying eyes. The Master Lock Vault is a go-to free, digital safe deposit box that helps keep critical information from falling into the wrong hands. Store passwords and digital copies of important documents all in one place with access from any smartphone or computer. The Master Lock Vault helps ensure this information is protected and secure but readily available when you need it. For more safety tips and products or to find a retailer near you, visit the Master Lock website and connect with Master Lock on social via Facebook, Twitter, Pinterest or YouTube. Secure gates, fences, sheds, storage lockers and more with the strength and reliability of the Master Lock M175XDLF Magnum Padlock - providing maximum resistance to cutting and sawing.